Lost Vape Paranormal color theme !! !Replay mode ready!!! Traffic Light theme by Patrikkoo, Based on DJLsb Vapes DNA 75c theme. Some icons are taken from Material dark theme by Tad Fisher. Mainly designed for Watts only mode. 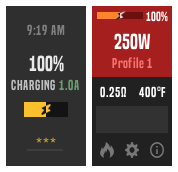 Red light displays resistance, Yellow displaying puff counts (in temp mode it will display temperature unit), and green light will display last puff time. 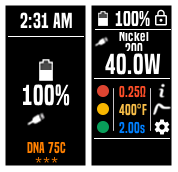 ndca-xsmalltheme-v101.ecigtheme Full custom theme for DNA75 black&white screen with clean and small font, one line for mostly all information on screen except the new coil question and secondary welcome screen. 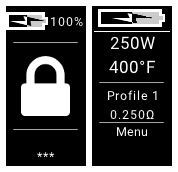 First welcome screen saying "hello" and secondary screen saying "i'm your vaping device". 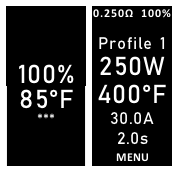 I also added profiles 1 to 8 with "unused" for those who only use some profiles and want to add custom screen on some unused profiles and i added profiles 1 to 5 with material "watts", "nickel200", "ss316", "ss316l", "titanium1". The .ecigtheme is configured with all images ready to use and with 3x click on fire to lock/unlock the device instead of 5x. 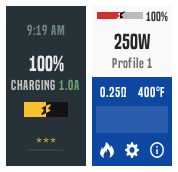 The battery is showed only on default screen and the new coil resistance is hidden. You will need to download profile 1 to 8 manually and add them to your custom screen if you want to use them. Enjoy!